Posted on May 21, 2014	by Katy K.
This is the book that won the Cybils award for Middle Grade Speculative Fiction this year, reviewed in brief because this week is shaping up to be crazy. The Screaming Staircase. 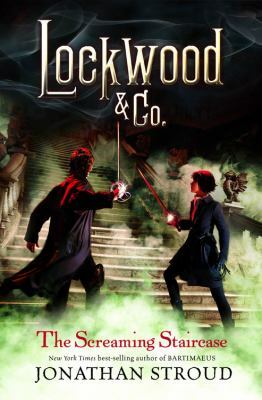 Lockwood & Co. Book 1. by Jonathan Stroud. Disney-Hyperion. 2013. This alternate-history story has a plot that keeps going like a rollercoaster, characters I could believe in, and is creepily atmospheric as all get-out. There’s something to appeal to all types of readers here – at least if the cover looks appealing in the first place. I was glad to be reading it on my work breaks rather than before bed at home, because it is scary – while none of the three members of our team die, there’s a fairly high body count over all. I think it’s still too intense for my nine-year-old, but this is perfect for older middle grade to teen reader looking for spooky, edge-of-the-seat suspense. This entry was posted in Books and tagged Armchair Cybils, Cybils, ghosts, youth fantasy. Bookmark the permalink.